Ready to become the future expert in dairy science and dairy technology? The dairy industry is an important branch within the food industry. The Dairy Technology specialization at University of Warmia and Mazury in Olsztyn focuses on the dairy production chain from primary production to technology and the consumer. The programme is meant for those students who would you like to be the future expert in dairy science and dairy technology. A graduate will learn about process technologies that convert raw milk into a variety of nutritious products. He/she will understand how the individual processes affect the product quality and will become knowledgeable about the whole production chain from milk production through processing, packaging, storage, until distribution and consumption. The programme also focuses on providing an in-depth insight into dairy process engineering. The students will learn, through 7-semesters of education, what methods of food preservation, which unit operations and processes, and what ingredients should be applied/used to achieve the desired functionality of the final product. Because the key element in dairy technology is an application of starter cultures and enzymes, the students will get an insight into underlying chemistry but also will obtain a deep understanding of biochemistry and microbiology. The students will benefit from pilot-scale practical experiments which will supplement the lectures and laboratory work conducted by leading scientists from UWM in Olsztyn. The added value of this programme consists largely in close collaboration with dairy companies and their connected industries (ingredient companies, equipment manufacturers, instrument manufacturers, etc.). Additionally, close collaboration with the industry through teaching, excursions and company visits will provide you with commercial insights and good opportunities for establishing a strong network. 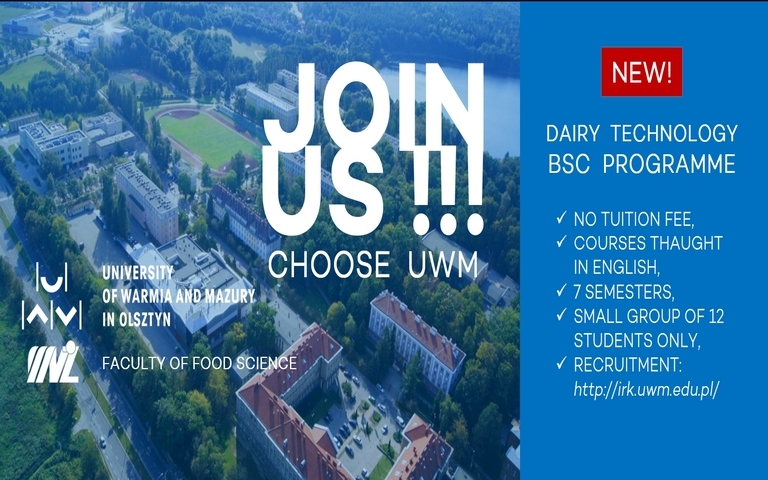 Faculty of Food Science at University of Warmia and Mazury (former University of Agriculture and Technology) has over 70-year-tradition of offering dairy education and now the specialization will be taught in English starting in Autumn 2018. Why Dairy Technology at UWM?